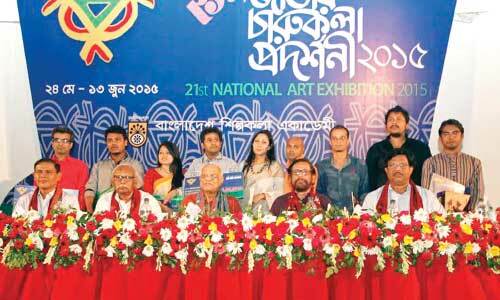 The 21st edition of the National Art Exhibition, featuring 273 works by 261 artists, was inaugurated by finance minister Abul Maal Abdul Muhith on Sunday at the Bangladesh Shilpakala Academy. The artworks include 158 paintings, 49 sculptures, 32 prints, 31 video installations and three performing arts pieces. Bangladesh Shilpakala Academy has been organising the biennale since 1975. Like in previous years, ten artists were bestowed with awards under different categories at the ceremony. Each of the artists received prize money, a crest and a certificate. Artist Ruhul Amin Rumee received Bangladesh Shilpakala Academy Award 2015 worth Tk one lakh. Mohammad Abdul Momen Miltan received Bengal Foundation Award with prize money of Tk one lakh. Rassel Kanti Das was conferred SPBA (Square) award worth Tk 80,000. Arif Al Karim Bhuiyan received AB Bank award with a sum of Tk 50,000. Iffat Rezwana Riya received Language Hero Gaziul Haque award with prize money of Tk 50,000. Habiba Akter Papiya got Begum Azizunnesa Award with prize money of Tk 25,000. Besides, three artists — Shimul Saha, Ruhul Amin Tareque and Mithun Kumar Saha received Bangaldesh Shilpakala Academy honorary awards with prize money of Tk 25,000 each. Mohammad Sana Ullah got Dipa Haque award with a prize money of Tk 20,000. The exhibition will continue for three weeks, from 11:00am to 8:00pm every day, till June 13. Asaduzzaman Noor, minister of cultural affairs, Begum Aktari Mamtaz, acting secretary of cultural ministry and eminent artist Rafiqun Nabi were also present at the inauguration session, which was held at the National Art Gallery auditorium. Liaquat Ali lucky, director general of the academy, presided over the inauguration. Mohamamd Anwar Hossain, director of fine arts of the academy, delivered a welcome speech at the programme.